In stock -This product will ship today if ordered within the next 1 hours and 13 minutes. Quest Vitamin E 400iu is made with natural source vitamin E with mixed tocopherols providing a balanced ratio of alpha, beta, delta and gamma tocopherols. Vitamin E is an antioxidant that contributes to the protection of body cells from oxidative stress. Why use Quest Vitamin E 400iu? 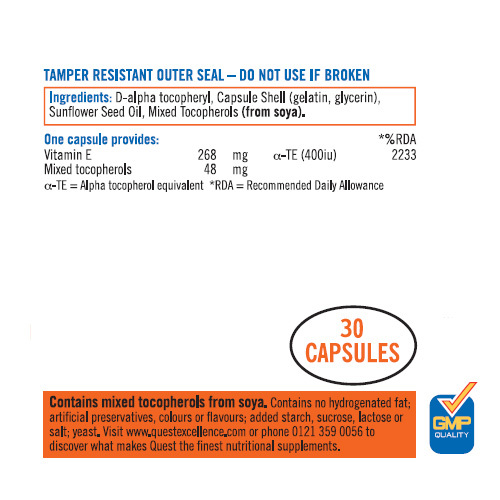 D-alpha tocopheryl, capsule shell (gelatin, glycerin), sunflower seed oil, mixed tocopherols (from soya). Contains No: Hydrogenated fat, artificial preservatives, colours or flavours, added starch, sucrose, lactose, salt or yeast. As a food supplement take one capsule daily with a meal. Swallow with water. 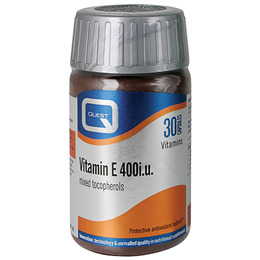 Below are reviews of Vitamin E 400iu - Cardiovascular Health - 30 Capsules by bodykind customers. If you have tried this product we'd love to hear what you think so please leave a review. Quest Vitamin E 400iu is a powerful fat-soluble antioxidant nutrient that plays a role in helping to maintain cardiovascular health. This product provides natural source mixed tocopherols.